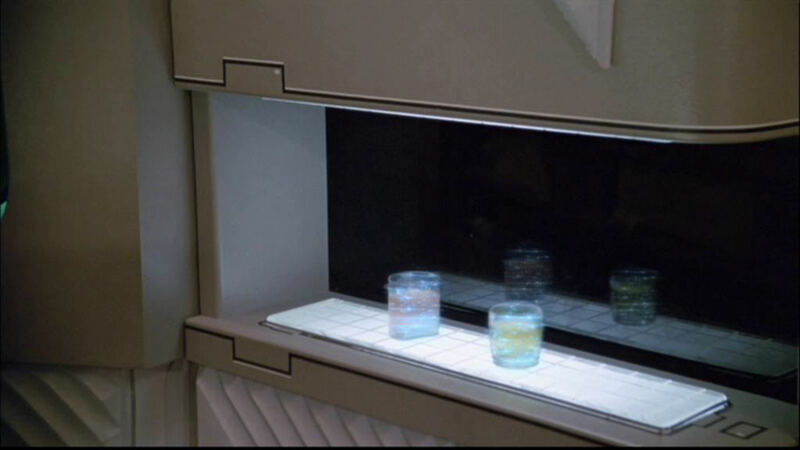 Ex Astris Scientia - Re-Used TNG Scenes in ENT: "These Are The Voyages"
The DVD commentary to ENT: "These Are The Voyages" by Denise and Michael Okuda states that the footage of Ten Forward in the series finale is taken from TNG: "Ménage à Troi". They do not provide further details, however. 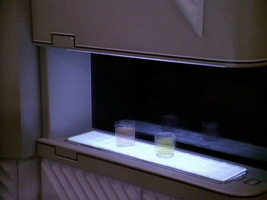 We have compared the original frames of the TNG episode (DVD version) with the new ones of ENT (DVD version as well). The latter were digitally remastered and converted to 16:9 widescreen format. Our comparison is relevant also in anticipation of the digital remastering of all 178 TNG episodes, which are being released starting in 2012. Note that, in order to allow the assessment of size and quality of the original material, rather than of our image processing skills, none of the following DVD caps are cropped or contrast-enhanced, unlike it is customary elsewhere on this website. Let us first have a look at the frame formats. TNG was filmed on 35mm with an aspect ratio of overall 1.37:1 and recorded on video with the normal TV aspect ratio of 4:3 (=1.33:1). Unless an anamorphic lens is being used that would create a purposely distorted projection in order to capture widescreen images on 35mm film (such as with CinemaScope), the projected image in the camera naturally has the same proportions as the result that we see on screen. 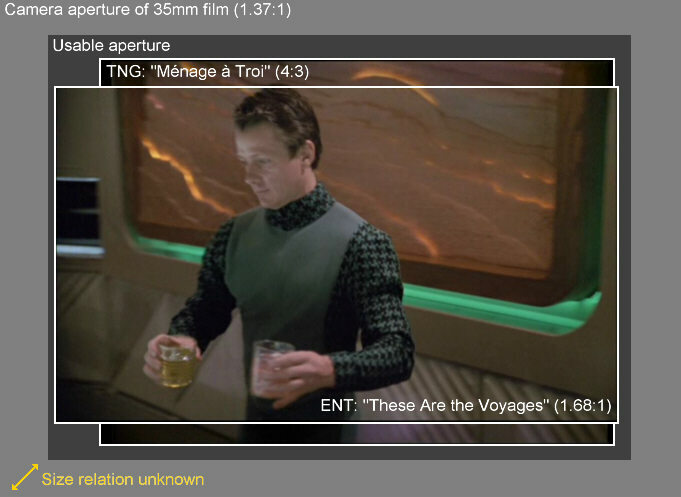 So the 4:3 standard NTSC or PAL frames of TNG: "Ménage à Troi" are corresponding 4:3 portions of somewhat larger 1.37:1 frames of the 35mm film. We do not need to know exactly how large a portion of the 35mm film was used. But in TV production a "safe action area" of 90% width is defined, which was required because of the overscan, the excess image that used to be invisible on conventional TV tubes. In other words, a margin of 5% on either side of the frame may vanish, so no important action should take place in this margin area. 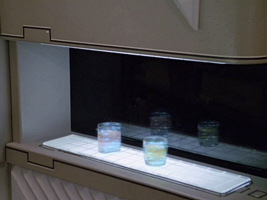 Enterprise was recorded at 16:9 (1.78:1) widescreen aspect ratio. It aired in letterbox format (with black bars on the top and bottom and without distortion). 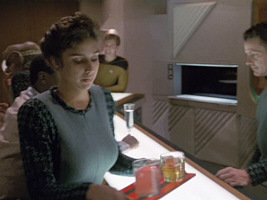 In order to be able to take advantage of the footage filmed for TNG, the original 35mm film was scanned once again for ENT: "These Are The Voyages". 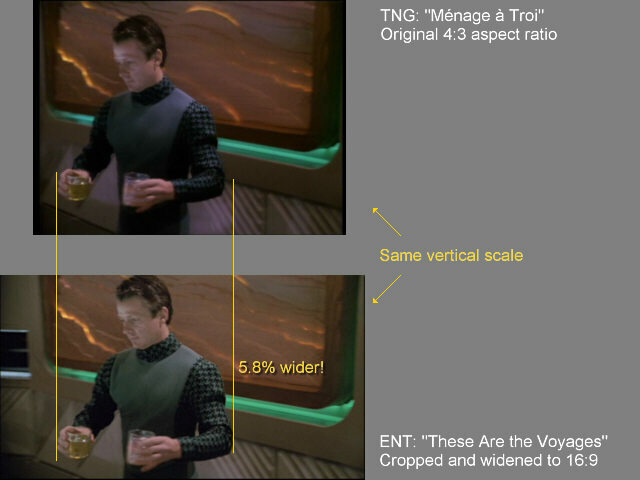 If we take the corresponding frames from the TNG and the ENT episode and make them congruent, we can see that the ENT frame is cropped on the top and bottom, and extended on the left and right owing to the required widescreen format. The lateral enlargement is obviously possible because the TNG episode did not use the full width of the 35mm film. The aspect ratio of the ENT frames is 1.68:1. But shouldn't the format on Enterprise be 1.78:1, rather than 1.68:1? Yes. In fact, as a conversion from 1.68:1 to 1.78:1, the scanned frames were simply accordingly distorted before they were inserted into the episode! In order to get the two versions of the footage congruent again for the frame size comparison, we had to revert this distortion. The most likely reason for the change of the proportions is that the scan area on the 35mm film could not be extended in lateral direction even more, because either it was already too close to the edge of the exposed area, or the scan equipment did not allow a wider scan area. Since too much information would have been lost when cropping the frames even more (by cutting off the tops of people's heads, for instance), it was decided to simply make the scanned image wider at the same height. The widening of the TNG footage in ENT: "These Are The Voyages" amounts to nearly 6%. Although it went unnoticed until now, this is a sizable distortion that should be avoided when remastering complete TNG episodes. Considering that the 35mm film had to be newly scanned anyway in order to obtain the HD widescreen format for Enterprise, it is obvious that the images were digitally processed as well. Actually, we do not know how much of the improvement is really because of additional image processing, and how much is already attributed to the modern digital film-to-video transfer. The ENT caps are generally a bit sharper. On the whole there is not really a visible improvement in resolution, however, this may in part be attributed to the DVD image sizes. Our TNG caps stills measure 1024x768 pixels, while the ENT caps are only 1024x576. The most significant difference lies in a greatly improved contrast and color reproduction. 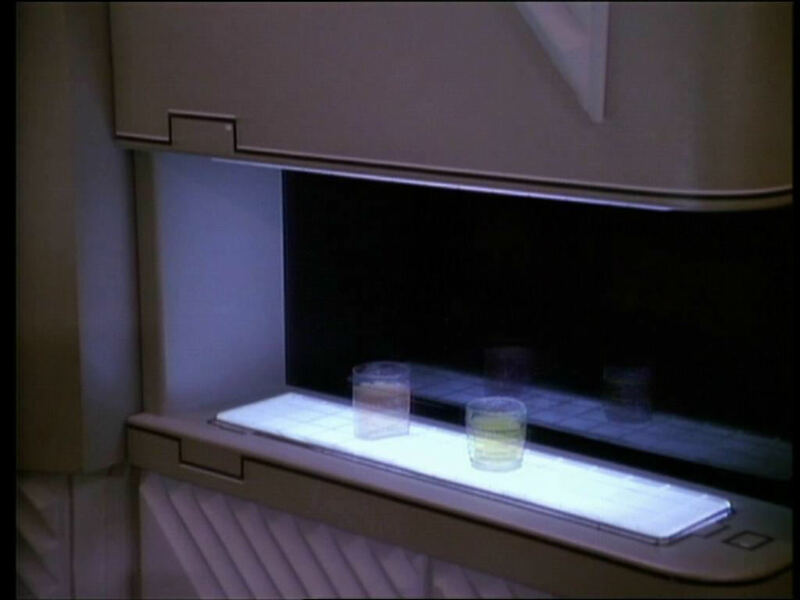 Replicator in TNG: "Ménage à Troi"
Replicator in ENT: "These Are The Voyages"
Looking at the replicator, we can also see that the materialization effect was updated, including the replicated glasses. 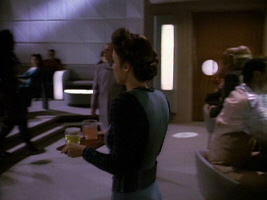 It is the only effect shot in this Ten Forward scene. 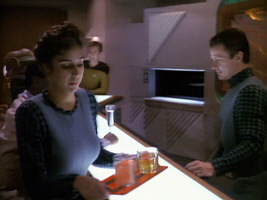 The update was not optional but required, knowing that the TNG light effects such as of the transporter were inserted into the video footage, not into the film. 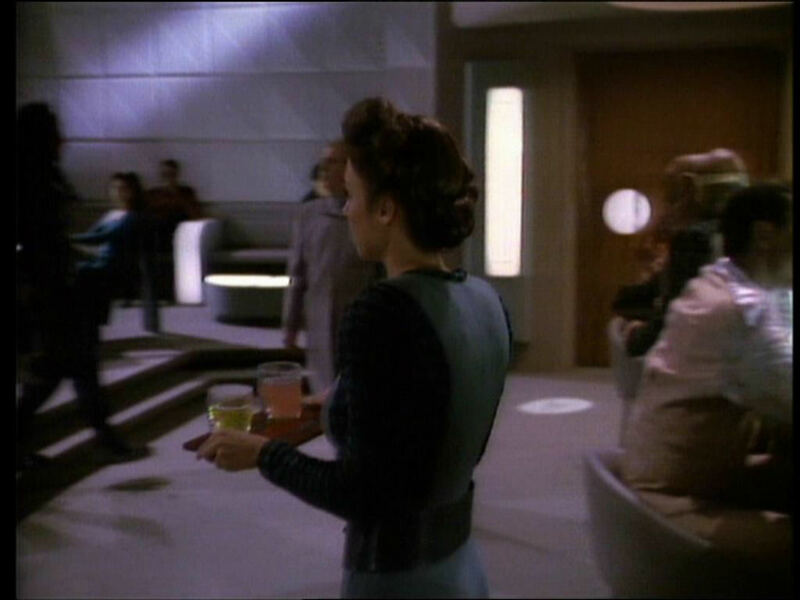 The new "sparkling water" replicator effect is much crisper than the old one, and particles spiraling around the glasses were added. Bar in TNG: "Ménage à Troi"
Bar in ENT: "These Are The Voyages"
We can see in all shots in Ten Forward that the formerly purplish hue of the scene is gone in favor of probably more natural colors. 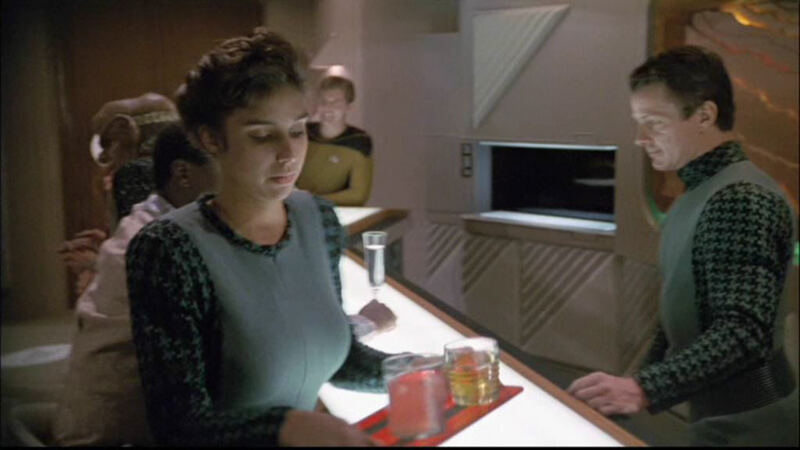 Also, many areas that were shaded in the TNG episode are now recognizable. Most obviously we can see a few faces that used to be entirely dark. 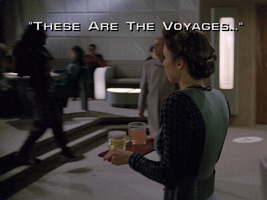 Waitress with tray in TNG: "Ménage à Troi"
Waitress in ENT: "These Are The Voyages"
Summarizing, we can can look forward to seeing TNG in more brilliant quality than ever. 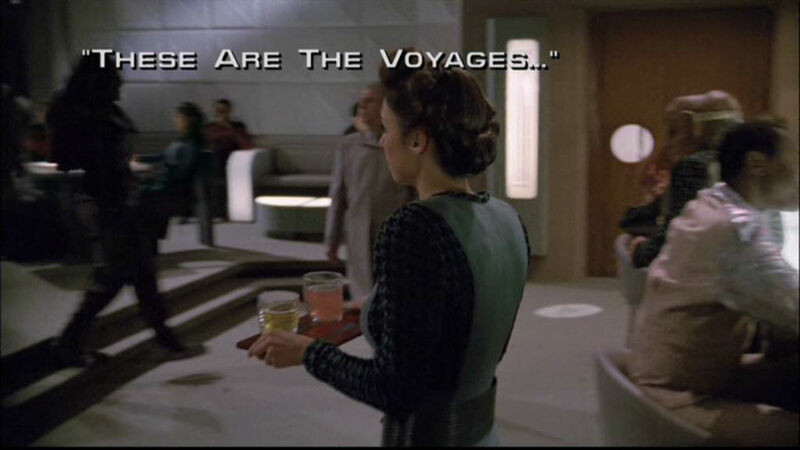 Remastering TOS was definitely worth the effort, and the results obtained in ENT: "These Are The Voyages" indicate that the same applies to TNG. Only a few technical obstacles must be overcome, because we can't imagine that the whole series would be released in a distorted version. Perhaps, if not feasible in another way, it should be taken into account to leave black bars on the left and on the right. The remastered version of TNG is released in 4:3 format, most importantly because it corresponds to the safe action area. This is explained in the special features "Energized: Taking the Next Generation to the Next Level", on the first season 1 disc.